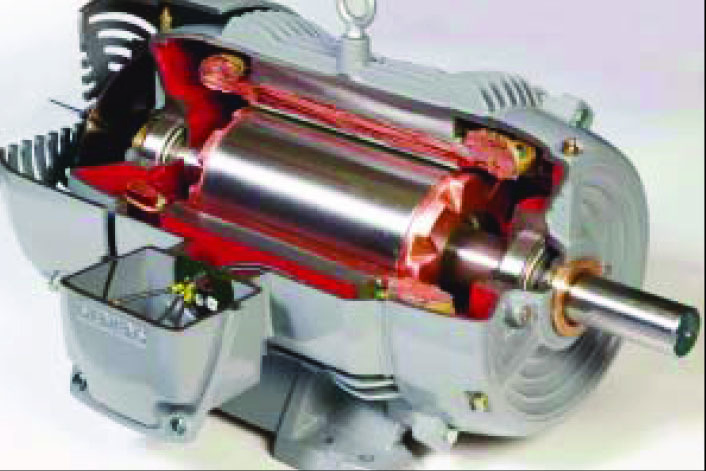 Electrical losses in AC induction motors can be reduced by adding more copper to the stator windings. NYCO Minerals produces wollastonite, a form of calcium silicate used widely in industrial applications such as reinforcing filler in injection-molded plastics. The company’s USA operations are headquartered in Willsboro, New York, where it mines and processes approximately 100 000 tonnes of wollastonite annually. Its products are in strong demand but energy costs at Willsboro have doubled over the past few years and management keeps an eye on its bottom line. Mineral processing plants tend to be energy intensive because they typically use hundreds of electric motors for milling, classification, purification, treatment and transport. Fig. 1: Siemens has introduced ultra-efficient motors featuring die-cast copper rotors and other design improvements. The motors are available in general-purpose TEFC and IEEE 841 (Severe Duty) configurations in sizes up to 20 hp. The operation runs 24/7 nearly every week of the year, so cutting back production to save energy is not an option. Instead, the company’s electrical supervisor, Rick Olcott, recognised more than 15 years ago that the most effective way to keep energy costs in line is to install the most efficient motors available. In the 1990s, that meant upgrading to Energy Policy Act (EPAct) motors, which are as many as four percentage points more efficient than old “standard-efficiency” motors. Later, Olcott began installing NEMA (National Electrical Manufacturers’ Association) premium motors, which are one to two percentage points more efficient than EPAct motors. But energy costs kept rising, jumping from between $0,04 and $0,05/kWh to $0,07 and then to $0,09 over the past few years. The solution, suggested by Jeff Lawrence of KJ Electric, NYCO’s electric motor supplier, and John Moller of Siemens Energy and Automation, (SE&A), was to replace a large number of NYCO’s motors with new Siemens IEEE Plus models. Those motors feature die-cast copper rotors (see Fig. 1) and other design improvements that make them one or two percentage points more efficient than current NEMA Premium motors1. IEEE 841 severe duty motors are used in plants which, like NYCO’s Willsboro operations, are dusty or contain chemically aggressive environments (see Fig. 2). 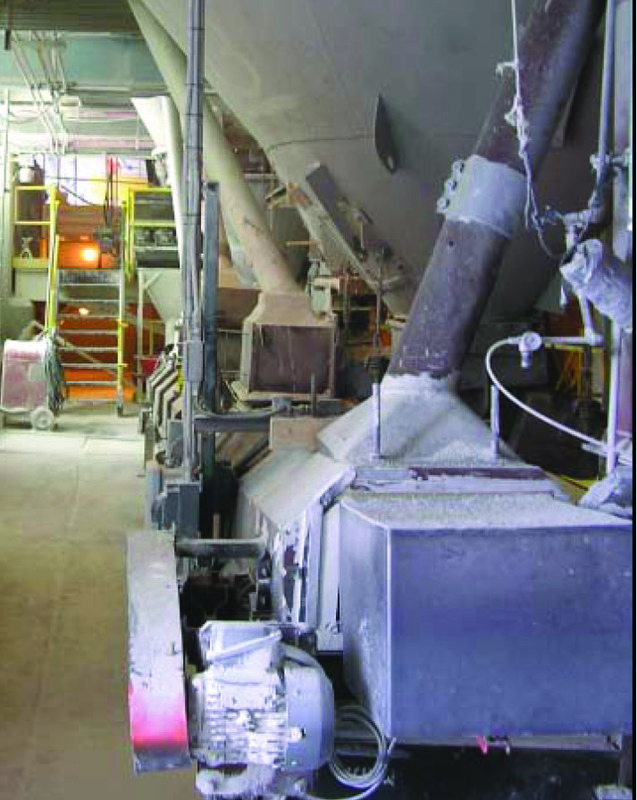 Wollastonite is non-toxic (it is an accepted replacement for asbestos) but, like any mineral particulate, can damage equipment, including motors. Fig. 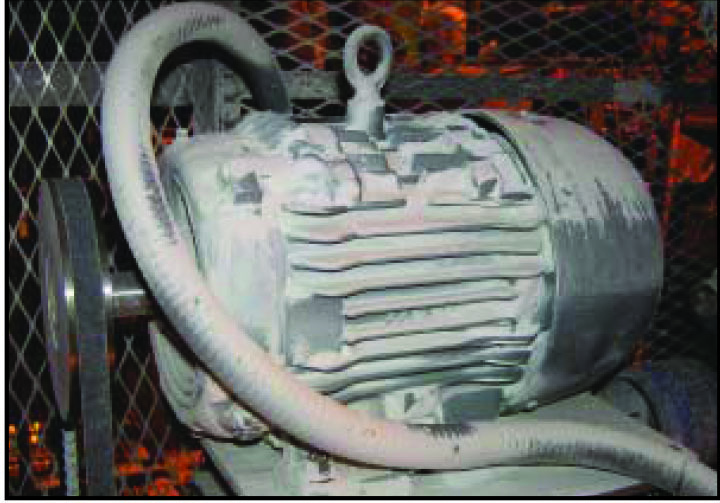 2: A mineral-dust covered blower motor at Willsboro illustrates the plant’s need for IEEE 841 Severe Duty motors. IEEE 841 motors also meet NEMA premium efficiency requirements, but Siemens copper-rotor ultra-efficient motors exceed those standards. Olcott’s initial purchase order included 150 motors in frame sizes ranging from 143T to 256T, with ratings up to 20 hp, most in the F1 configuration, plus a few in F2 and F3. He recently added a few C-face motors not included in the original blanket order. In May 2007, replacement was proceeding as fast as possible, given the plant’s continuous operating schedule. Examples of motors replaced include the blower motor shown in Fig. 2, a belt conveyor motor which transports material between the crushing and beneficiation departments (see Fig. 3), a pair of boiler feedwater pump motors (see Fig. 4), and about 15 more in sizes ranging from 1 to 20 hp. The current round of motor replacements was completed during a scheduled maintenance shut-down in 2007. The initial replacement order was valued at approximately $80 000. 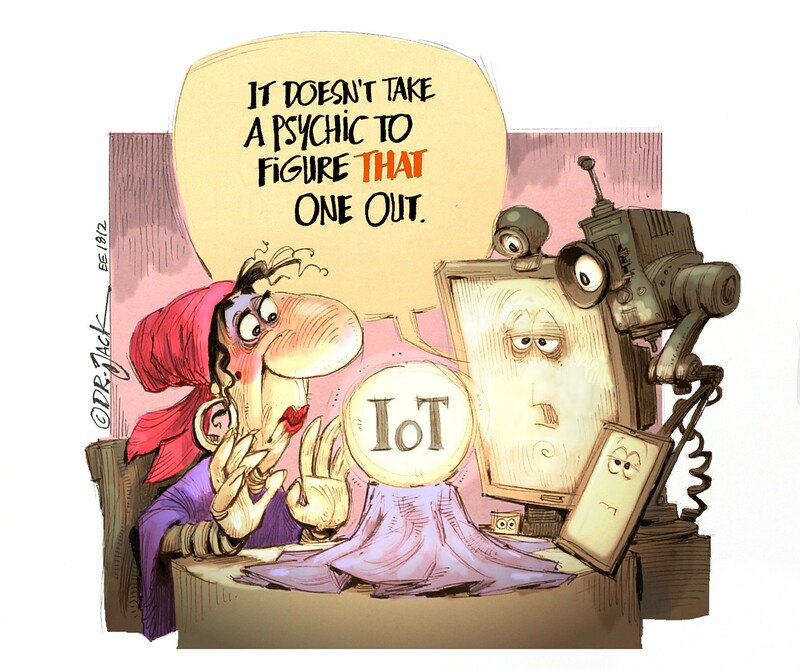 Olcott sees that figure as an investment. He expects the motors will pay for themselves in two to three years’ time, some even before that. No operating cost data was available at the time of writing but KJ Electric’s Jeff Lawrence and John Moller from Siemens calculated the savings that should be realised for the range of motor sizes involved (see Table 1). Table 1: Annual energy savings based on Siemens’ NEMA-Plus SD-100 IEEE 841 motor with copper rotor technology (data courtesy KJ Electric and Siemens Energy). These are approximate values as they do not necessarily correspond to the actual load factors at which all motors of a given size operate. On the other hand, the estimates are based on utility rates prevailing in early 2007, and those rates might increase in the future, thereby shortening the respective payback periods, for example. The key point is that, once the motors have paid for themselves, they will continue to generate savings throughout their service lives. It is well-known that the cooler motors run, the longer they last, and that premium efficiency motors of all types tend to run cooler than less efficient types. With their exceptionally low power (I2R) losses, copper-rotor motors should run cooler still. In fact, SE&A says its new copper-rotor motors are designed “very conservatively” with regard to operating temperature, using F-class winding insulation for B-rated temperature rises at a service factor of 1.15. NYCO Minerals is confident the motors will provide the company with years of low-cost, satisfactory service. On the other hand, the estimates are based on utility rates prevailing in early 2007, and those rates might increase in the future, thereby shortening the respective payback periods. About two-thirds of an AC induction motor’s electrical losses occur in the stator, and motor manufacturers have made great strides in reducing these losses by adding more copper to the stator windings, so reducing wasteful, resistive (I2R) heating. NEMA Premium-grade motors are largely based on this practice. Rotor losses account for about 25% of total losses. These losses occur in three forms: slip losses, magnetic core losses and, again, I2R losses in the rotor’s conductor bars. John Caroff of Siemens Energy and Automation explains that the motors’ high efficiency results from their die-cast copper rotors, combined with a careful redesign of the entire motor to optimise the properties brought by copper and with stringent quality control during manufacturing to minimise electrical and stray-load losses. Substituting die-cast copper for traditional die-cast aluminum in the squirrel cage decreases resistive loss because copper’s volumetric electrical conductivity is approximately 66% higher than that of aluminum. Copper provides other benefits as well, including the ability to shorten the lamination stack (so reducing cost and, depending on design, reduce slip). How much difference does higher efficiency make in the cost of motor ownership and can higher efficiency justify the cost of a more efficient motor? Consider this: an average 10 hp Energy Policy Act (EPAct), totally enclosed, fan-cooled (TEFC) general-purpose motor costs about $506 after dealer discount. Knowing the duty and load cycles, the utility rate and the nominal (dataplate) efficiency, we can calculate the annual cost of operating the motor. Fig. 3: A 2 hp SE&A IEEE Plus belt conveyor motor which transports finely-ground product to the beneficiation department. It was one of the first copper-rotor motors installed during the current replacement programme. The data plate lists the motor’s NEMA nominal efficiency at 87,5%, one percentage point higher than called for under NEMA Premium standards. If we assume that 10 hp EPAct motor operates 8000 hours per year at 75% load, and that electricity costs $0,0617/kWh, and that its efficiency is 90,7% at 75% loading, we find that the motor consumes $3,061 in electric power annually, or about six times the motor’s purchase price. If purchased to replace an existing “standard efficiency” motor, the EPAct motor would pay for itself in 2,79 years. According to the MotorMaster+ free online motor selection and management tool developed by the US Department of Energy, an equivalent NEMA Premium motor costs about $117 more than the EPAct motor2 but operates at an efficiency of 92% at 75% load, enabling it to use $42 less per year in energy. So, the gain of 1,3 percentage point in efficiency pays off the additional cost of the more efficient motor in 2,75 years when one includes a 0,1 kW demand savings, as MotorMaster+ does. NEMA Premium motors fitted with copper rotors offer even better economics. MotorMaster+ lists the Siemens GP100 as an example in this size. The US Department of Energy software cites a discounted price of $553 for this motor, which is about $70 less than that for the “average” aluminum rotor NEMA Premium motor, as defined by MotorMaster+. The annual savings, compared with an average EPAct motor and as calculated using MotorMaster+, are $48 per year, leading to a payback of only 0,98 years. Fig. 4: An electrician installing two copper-rotor 10 hp Siemens IEEE Plus motors to supply boiler feedwater for process steam. The motors are rated for a NEMA nominal efficiency of 92,4% at 100% load factor, which exceeds the NEMA Premium requirement by 0,7 percentage points. Tests conducted for the Copper Development Association show that a copper-rotor Siemens motor of this size actually displays an efficiency of 92,72% at full load, and greater than 93% at a 75% load factor. After that, all savings are pure gravy and, in fact, payback can often be much quicker. For a company like NYCO paying $0,09/kWh, that “average” 10 hp NEMA Premium motor would pay for itself in a little over 2,5 years, while a motor with a copper rotor would pay back its cost premium in just 0,44 years. Taking a longer view, $74 saved per year adds up to $1480 over the 20-year life of the motor, enough to buy one new motor every 7,5 years, assuming the national average $0,617/kWh utility rate. At the $0,09/kWh NYCO Minerals pays, the savings add up to $108 per year and $2160 over two decades. The bottom line is that efficiency is important, and life-cycle costs are all that count in the end. 1. 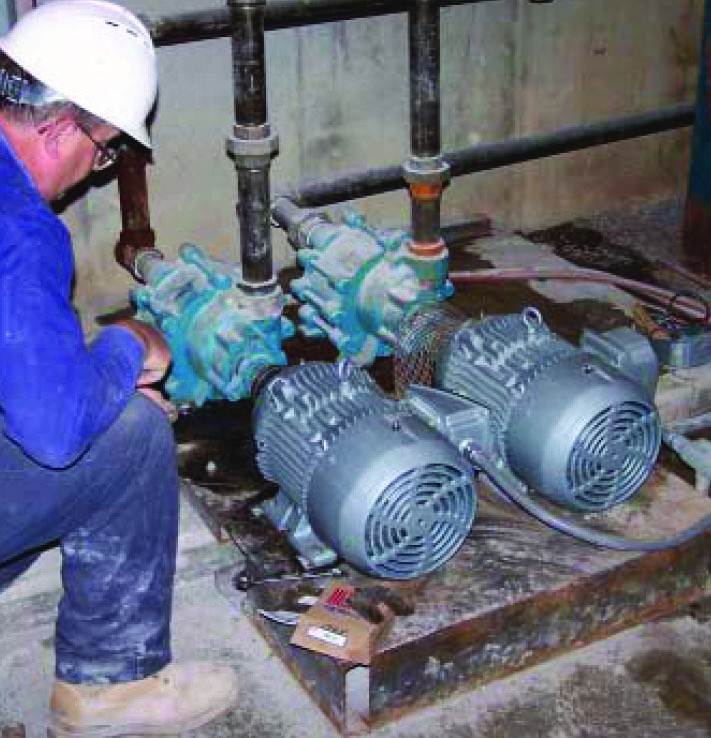 In all sizes up to 500 hp, there are IEEE 841 motors from one or more manufacturers that meet NEMA Premium-efficiency standards, and there are motors in all but seven sizes that exceed those standards. “IEEE Plus” is Siemens’ trade name for its version of the IEEE 841 motors, which use die-cast copper rotors to raise efficiency. 2. Prices and discounts are taken from MotorMaster+ 4.0.